For Intel chips, cooling is everything. The announcement of the MacBook Air yesterday means that a large portion of Apple's laptops are powered by Intel "Y" processors. The fanless 12-inch MacBook was the first to include one of these low-power chips. 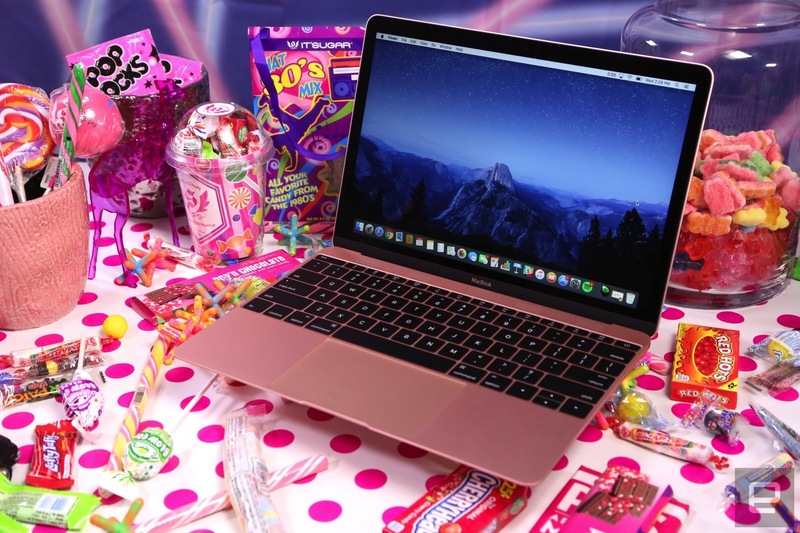 The new MacBook Air is the second, but this time Apple is using it quite differently. Because Apple doesn't post model numbers for the processors in its laptops, it's difficult to know what exactly is going on inside them. This is compounded by the fact that the company now has three computers -- the 12-inch MacBook, the entry-level MacBook Pro, and the new Air -- in the same price range, all configurable with "dual-core i5" processors. If you're thinking of buying one of Apple's "cheap" laptops, it's worth knowing what makes them different from one another. Let's start with what a "Y" processor is and isn't. Intel's ultra-low power chips used to be labeled "Atom," and had a completely different architecture to its desktop and laptop processors. That didn't go very well for various reasons, so Intel gave up on Atom. To replace it, Intel essentially took the "U-series" chips that were wildly successful in the MacBook Air and Windows Ultrabooks, slowed and trimmed them down, and created a new category of processors. They're built to sip power when compared to the U-series chips, or rather, they're built to not produce much heat, and Intel achieves that by limiting power draw. A quick aside: Depending on the chip, Intel either refers to these processors as Core M or just throws a Y somewhere in their model number. This is infuriating. They all used to be called Core M, and so I'm just going to call them Core M for simplicity. The chips in the entry-level MacBook trio are pretty similar. All have the same basic CPU architecture, with equal core/thread counts (2 and 4, respectively) and cache sizes. They diverge slightly in featuresets, and the U-series chip in the dual-core MacBook Pro pairs with faster, less power-efficient RAM, but the main differences you'll find are in clock speeds and integrated graphics. The 12-inch MacBook comes with an m3-7Y32 in its $1,299 base configuration, or an i5-7Y54 chip at $1,399. Despite the "m3" and "i5" prefixes, these are basically the same chip, tuned differently. Intel even lists them at the same suggested price on its website. The m3 has a base frequency of 1.1GHz and a max turbo frequency of 3GHz, the i5 has a base frequency of 1.2GHz, and a max turbo frequency of 3.2GHz. While I don't have two machines in front of me to test this theory, the i5 will likely increase clock speed more aggressively, but beyond that they are very similar. The new $1,199 MacBook Air hasn't been dissected yet, but it almost certainly has the i5-8210Y inside. Also a Core M, it has a base frequency of 1.6GHz, and a max turbo frequency of 3.6GHz. It appears to be a variant of the 8200Y we've seen in convertibles like the Dell XPS 13 2-in-1. Where the Air differs from both the MacBook and the XPS is in its cooling: It appears to have a fan, and this would make it a much more capable machine. In fact, it pushes it closer in performance terms to the third laptop in Apple's lineup. The MacBook Air's fan made a brief appearance on stage yesterday. That laptop is the entry-level MacBook Pro. The $1,299 version has an i5-7360U, which has the same turbo frequency of 3.6GHz as the new Air, but runs at a base frequency of 2.3GHz. It also has Iris Plus Graphics 640, while all the chips I've mentioned till now have had UHD Graphics. Without going into too much detail, UHD Graphics are really just concerned with making sure things run smoothly, aiding in things like video decoding, while the Iris Plus Graphics will assist with multiple monitor setups and even let you play something light like Dota 2 on low settings. So, on paper, all the CPUs are dual-cores capable of hitting speeds between 3GHz and 3.6GHz. But in reality, the three implementations are quite different. Intel has a helpful, but often misunderstood measurement to help us understand why: Thermal Design Power (TDP). Rather than being a measure of how powerful a processor is, TDP tells us how much heat it dissipates at a certain frequency. All Core M chips are rated for almost identical TDPs at the same frequencies. Idling at 600MHz, they'll likely dissipate around 3.5W of heat, at 1.1-1.3GHz they reach 4.5W and at 1.6GHz they're all around 7W. Unfortunately, Intel doesn't publish Core M TDP figures above that, but the dual-core U-series in the MacBook Pro dissipates 15W at 2.3GHz, and given the architectural similarities, the Core M chips are likely in the same ballpark. TDP is mainly useful for the manufacturers Intel sells to: It helps them to pick the right part for their device. Apple, for example, knows that if it throws a chip that dissipates 7W of heat in a chassis that can easily shed 7W of heat, it doesn't need a fan, and that's what it did with the 12-inch MacBook. Now, everyday computing throws some curve balls -- moments when you need extra power to prevent a machine from stalling -- and that's why boost clocks exist. They let a chip kick up to higher speeds for as long as it can stay cool, before dropping the frequency back down. A desktop PC with a good cooler can sustain a high boost clock indefinitely. Outside of gaming laptops with giant vents, portable machines usually can't. It all depends on the cooling system the manufacturer has implemented. When a system has no fan, though, it has a fixed limit for heat dissipation. Because of this, the 12-inch MacBook, for example, isn't actually capable of boosting to its advertised top clock in everyday operation. The lack of a fan also means ambient temperature plays an important role in performance. As I discovered at SXSW back in March, working in hot Texan sunlight can seriously degrade performance. That's because, unless you're doing literally nothing, the i5 MacBook's CPU won't be at its 1.2GHz base clock: It's almost always hovering above 1.5GHz during regular operation. A Core M i5 MacBook will quickly hit temperatures of 100C while boosting, and typically fails to sustain clock speeds much higher than 2GHz. In a more typical test -- playing back a 4K video on YouTube in a 70-degree-fahrenheit room -- the MacBook's CPU boosts up to 2.5GHz before hitting its thermal threshold (100C) and dropping down to 2GHz. This task is fairly middle-of-the-road, and nicely illustrative of the Core M chips' inability to handle high clock speeds. The MacBook Air, however, won't have this issue to the same extent. Pairing the Core M chip with a fan completely changes the proposition. Now, this is somewhat uncharted territory, and we'll have to employ some guesswork here. I've never used a machine with this class of chip and a fan. But with the fan running, the Air should be able to persistently run at boosted clock speeds way in excess of the MacBook, which already bests the outgoing MacBook Air in almost every performance metric. For an idea of performance, even with a fan running fairly slowly, the dual-core MacBook Pro can move away the 15W of heat its CPU produces at 2.3GHz and keep clocks steady. The fan can also increase its speed to help the CPU sustain close to its max 3.6GHz boost clock for longer if you're, for example, exporting a video file. Going on Apple's on-stage imagery, the Air's cooling system is not exactly robust: a shallow heatsink with an adjacent fan that exhausts heat below the display. But even this limited implementation of active cooling will allow the Air to perform more like the dual-core MacBook Pro than the 12-inch MacBook. Now, my 12-inch MacBook is a perfectly good word processor, web browser and occasional image editor. But it can't do what my old, 2013 MacBook Air could. I abused that machine with unnecessarily heavy workloads -- Premiere, InDesign, Photoshop and the like -- for years. It was never massively fast, and it often sounded like it was about to hover off my desk, but it was definitely capable of ploughing through complex tasks, so long as you had the patience. Time has obviously erased the Air's performance, but despite the "low-power" designation of the new Air's chip, it should be able to handle similar tasks with no issue. But why is Apple even using a Core M chip, if it's going to include a fan? It clearly believes that it's better to push a Core M chip up than a U-series chip down. Most tasks you do on the MacBook Air won't require anywhere near the MacBook Pro's 2.3GHz base clock. Pairing Core M with a fan should offer the best of both worlds, if Apple has calculated its thermals right. We'll have to wait to test it for ourselves, but it's a safe bet that the Air will straddle the performance between the MacBook and the entry-level MacBook Pro. In light tasks, it should sip power like a MacBook and run silently. For heavier workloads, it should perform similarly to the Macbook Pro. The only time you should notice a major difference between the Air and Pro is when the systems' GPUs get involved: While neither are particularly strong in that respect, the gulf between the two graphics packages is nonetheless huge. 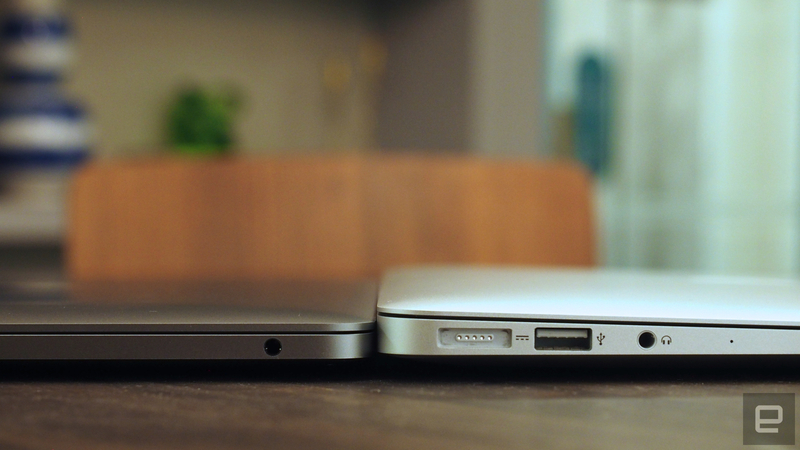 The entry-level 13-inch MacBook versus the old MacBook Air. It should be clear by now that making sense of Apple's laptop lineup isn't easy. First up there's the entry-level MacBook Pro, which on paper, has more in common with the old MacBook Air than it does the other Pro machines. It has the same class of chip as the old Air, it's thin, it's light and it lasts for a long time away from an outlet. The other side of the equation is the 12-inch MacBook, whose raison d'etre is "be very thin and light." The price-to-performance ratio for the mini laptop is out of whack, and it's only for those that value portability above everything else. The new MacBook Air sits between the two. It deviates from Apple's original hardware blueprint for the Air, but its components are modern reimagining of what the Air stood for. It was always intended to be an ultra-portable that can, for most people, be the only computer they need. Apple is betting that this "low-power" chip, paired with active cooling, can do the same job as the original Air's beefier processor. We'll know soon if that bet pays off.